By: Reese, John P.; Forehand, Jack M.
Today's investor is faced with a myriad of investment options and strategies. Whether you are seeking someone to manage your money or are a self-directed investor deciding to tackle the market on your own, the options can be overwhelming. In an easy-to-read and simple format, this book will dissect the strategies of some of Wall Street's most successful investment gurus and teach readers how to weed through the all of the choices to find a strategy that works for them. The model portfolio system that author John Reese developed turns each strategy into an actionable system, addressing many of the common mistakes that doom individual investors to market underperformance. This book will focus on the principles behind the author's multi-guru approach, showing how investors can combine the proven strategies of these legendary "gurus" into a disciplined investing system that has significantly outperformed the market. 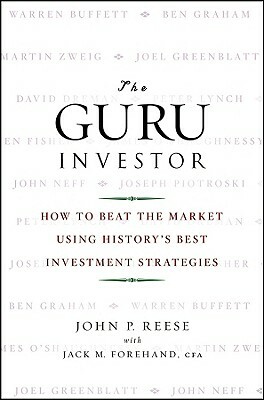 Gurus covered in the book are: Benjamin Graham; John Neff; David Dreman; Warren Buffett; Peter Lynch; Ken Fisher; Martin Zweig; James O'Shaughnessy; Joel Greenblatt; and Joseph Piotroski. Author Name: Reese, John P.; Forehand, Jack M.